Ukrainian President Petro Poroshenko has told the International Monetary Fund (IMF) that his government cannot raise bilateral financing from the European Union (EU) or the NATO allies, and now requires $50 billion, triple the $17 billion agreed with the IMF last April. At a meeting on Wednesday in Davos, Switzerland, with an IMF delegation headed by managing director Christine Lagarde (lead image), Poroshenko, his finance minister, Natalie Jaresko (2nd from left) and National Bank of Ukraine Governor Valeriya Gontareva (1st left), also disclosed that Kiev will default on repayment of its sovereign bonds unless there is an immediate agreement from the US-based Franklin Templeton group and other bondholders to accept a moratorium on their coupon payments and postponement of bond maturities for several years. Lagarde announced that the terms of the current IMF staff mission in Kiev, which arrived on January 8 under former Bulgarian finance official Nikolai Gueorguiev, should now be revised. Gueorguiev had been planning to return to Washington on January 29. His technical report estimating the Ukrainian government’s cashflow, liabilities, repayment shortfall, and solvency was due to be submitted to the IMF board in early February; it must now be redrafted. “We will consult with the IMF Executive Board on the authorities’ request,” the IMF quoted Lagarde as saying. “Following the Executive Board’s agreement to proceed, the Fund mission currently in Kyiv would begin [sic] discussing the policy program underpinning the authorities’ request.” IMF sources admit that Gueorguiev will be staying in Kiev into February. Gueorguiev refuses to respond to emailed questions. In mid-December the IMF admitted its money for Ukraine under the Stand-By Arrangement (SBA) of last May had been suspended until “technical discussions” were followed by “policy discussions”. Altogether, converting IMF Special Drawing Rights (SDRs) into US dollars, about $6 billion in three tranches have been withheld since last July. 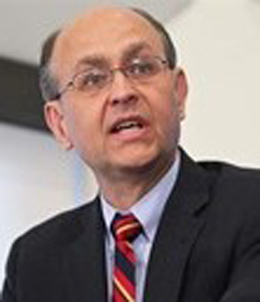 Last month, Ukrainian Prime Minister Arseny Yatseniuk called for an unconditional cash grant of $15 billion. This was not accepted in the discussions conducted by Gueorguiev, according to Fund insiders. For the full story, read this. In December, William Murray, Lagarde’s spokesman, insisted that if Ukraine wanted extra money without conditions, it had to get it from “the donor community”. 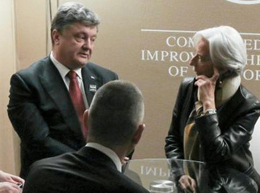 Lagarde and Poroshenko have now agreed to reopen “policy discussions” on who the donors might be. Polish banking authorities, headed the National Bank of Ukraine between the ouster of President Victor Yanukovich last February, and the election of Poroshenko at the end of May. Kubiv’s record can be read here. Gontareva was Poroshenko’s replacement for Kubiv. Pictured wearing fur cuffs at the meeting with Lagarde, Gontareva has been under attack in the Ukrainian press and parliament for incompetent handling of the foreign exchange rate, which has sunk in black market trading to 20UAH to the US dollar. The official rate on December 1 was 15.06. Since then Gontareva has been under pressure from several factions of the Verkhovna Rada to resign. With the stress now physically visible, Gontareva has told parliament the hryvnia will continue to fall until the IMF agrees to triple the bailout. A Kiev district court has ordered prosecutors to investigate Gontareva’s currency interventions for alleged corruption. Until today Jaresko has insisted the government in Kiev would not default on its bonds. She is now making the triple bailout a precondition for a deal with bondholders. After meeting Lagarde, Jaresko claimed foggily: “The markets expect this step. They should be welcomed to accept it.” Jaresko’s record can be followed here. 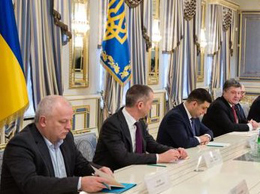 The senior US official in charge of saving Ukraine from financial collapse, Nathan Sheets (right), a Treasury undersecretary, on his visit to Kiev last week, described US terms as more stringent than the State Department and White House have been broadcasting. According to Sheets, the US will hold on to its loan guarantee for Ukraine of $1 billion until Poroshenko can meet the IMF conditions. The Treasury is promising another $1 billion in loan guarantee by year’s end if the Ukrainians can demonstrate good behaviour while on parole. “As part of the international effort, the United States intends to provide a $1 billion loan guarantee to the Government of Ukraine in the first half of 2015, provided Ukraine remains on-track with the reform program it has agreed with the International Monetary Fund (IMF). If Ukraine continues making concrete progress on its reform agenda and if conditions warrant, the U.S. Administration will be willing, working with Congress, to provide an additional $1 billion loan guarantee in late 2015″. 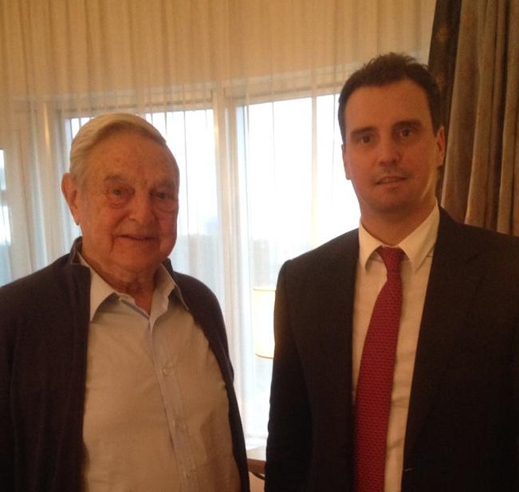 The day before he met with Sheets, the Ukrainian Minister of Economic Development Aivaras Abromavicius (below right) reported that he had asked George Soros (left) for advice on tripling the bailout. Soros told him to get the money from the EU and avoid the IMF. Soros has also proposed avoiding a bond default by asking the mostly American bondholders to accept a stretch-out of their paper maturities in exchange for higher interest rates and larger coupon payments to be covered by the extra cash he thinks the EU should stump up. 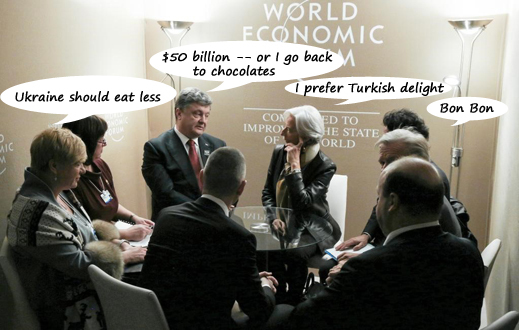 In Kiev on January 15 Poroshenko and Soros agreed to discuss his plan once more in Davos. Sources in Davos claim Soros was represented at today’s meeting of Ukrainian and IMF officials, sitting on the Ukrainian side. Accompanying Lagarde were Gilles Bauche, a veteran French Treasury operative, and Gerry Rice, head of Communications at the IMF. Lagarde’s office refuses to identify the figure with the military crewcut in the foreground (right). So far, the European governments are unwilling to support the Soros proposals. They are insisting the terms for a bailout must be negotiated with the IMF, and voted by the board. The Polish Prime Minister, Ewa Kopacz – just four months into her term, with an election due in October — has just announced a Polish government loan of €100 million to Ukraine. The small print restricts the payout to instalments of no larger than €10 million per annum over a decade, with performance conditions besides. The announcement is unpopular with Polish voters. Russian sources believe Poroshenko and Yatseniuk have calculated that the escalation of fighting along the line of contact in eastern Ukraine, and at Donetsk, would improve their international bargaining position, win or lose. The loss has proved more severe than expected. 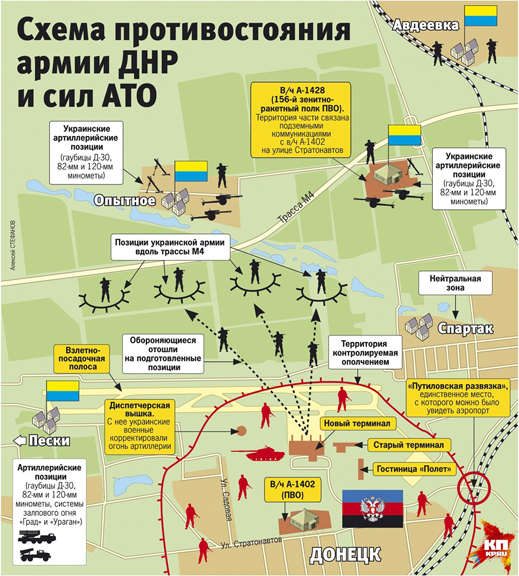 The defeat of the Ukrainian Army at Donetsk airport has come after days of artillery bombardment, aerial bombing, and an attempted breakthrough by the Army’s 93rd Mechanized Brigade to recover the New Terminal which was lost on Saturday. Colonel Oleg Mikats, the brigade commander, has been captured (below left, before; after, right front). His unit, which has a nominal strength of 3,000, has been destroyed. A large stock of US arms, ammunition and explosives has been captured from the Ukrainian Army and displayed on Novorussian media. The Novorussian media are predicting that if the Ukrainian Air force continues to bomb civilian targets in Donetsk and Lugansk from bombers, the “Novorussian air force” will rise to stop them. The Special Monitoring Mission (SMM) of the Organization for Security and Cooperation in Europe (OSCE), has been unable to report on the airport battle.